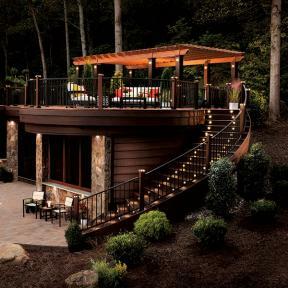 To successfully power any low-voltage deck lights, you will need to use a transformer. 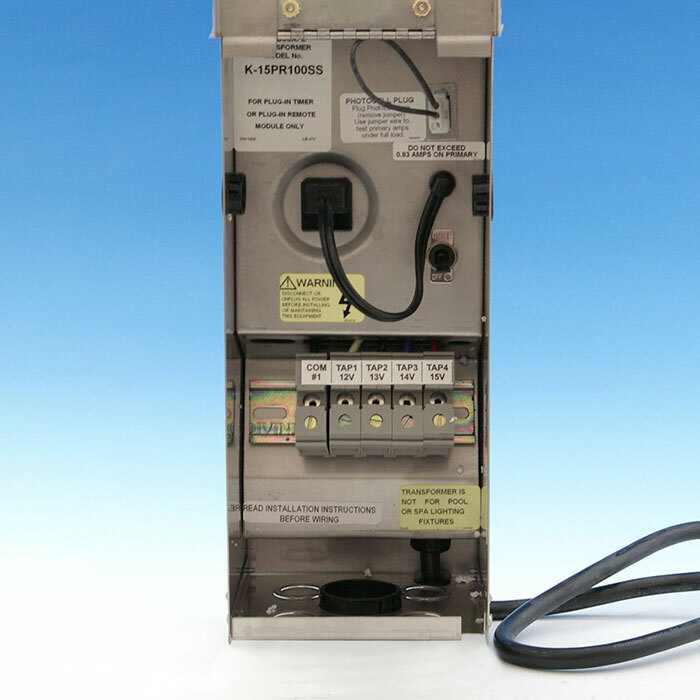 Transformers convert the standard 110-volt electricity coming from your standard house outlet down to the lower 12-volt level compatible with low-voltage lighting. 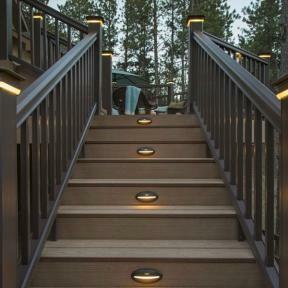 Low-voltage deck lights are easy and safe to install without the need for an electrician. Solar lights use a solar panel to convert sunlight into electricity. This energy is stored in rechargeable batteries within the light. The light also contains a photo cell that will automatically turn the light on when it's dark. The terms “AC” and “DC” refer to types of current flow in an electrical circuit. ”AC” stands for Alternating Current, which means that the electrical charge changes direction periodically between positive and negative. AC is the flow of energy used power to large areas and buildings such as houses, apartment buildings, and schools. AC transformers are used to reduce the AC current from your house to the lower voltage required by incandescent deck lights. They can be used with timers and/or photocells, however, generally do not work with dimmers. Physically larger than their DC counterparts, they are available as either single-tap or multi-tap for multiple lighting outputs. ”DC” stands for Direct Current, which means that the electrical charge only flows in one direction, remaining constant the whole time. DC is the flow of energy used to power almost all electronics such as televisions, cell phones, and flashlights. 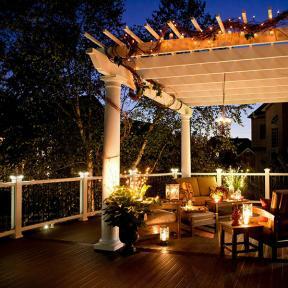 DC transformers convert the AC electrical current in your home to the 12 volt DC energy level required for deck lighting. 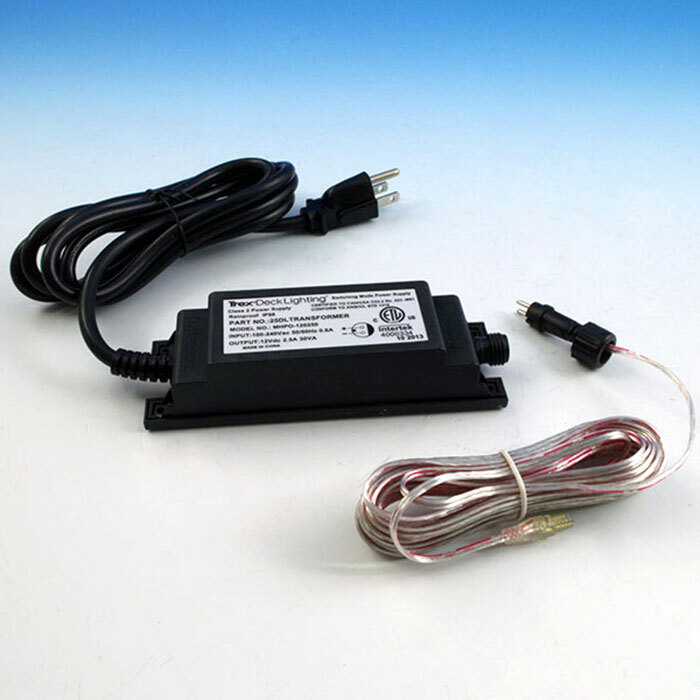 Largely used for LED deck light applications, DC transformers are typically smaller than their AC counterparts and can be difficult to find at most home improvement stores. DC transformers are widely compatible with timers, photocells, and dimmers. All of the transformers, both AC and DC, available from DecksDirect are certified weather-proof. Rain, snow, hail, and wind; our transformers are rated tough enough to survive the elements. We also offer several transformers that are guaranteed waterproof, meaning that they can occasionally be submerged under water and still work like before. 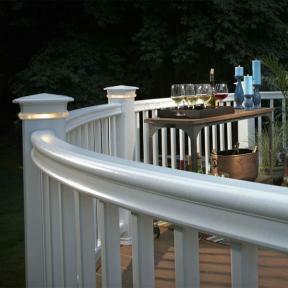 Perfect for installation near pools, on docks, or in highly wet climates. 1. How many lights are you installing? 2. What are their wattages? 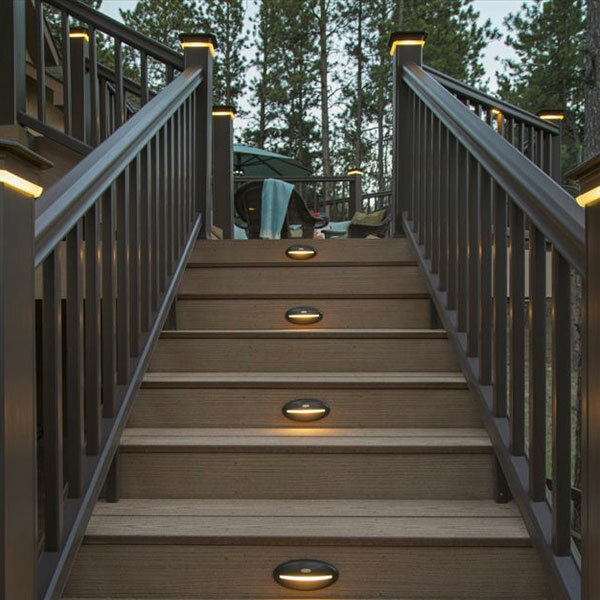 To find the wattage of individual lights on decksdirect.com, go to the product page, scroll down to product specifications, and find the “Wattage” section. Add together the total wattage for all of your light fixtures, then include an additional 10% wattage to allow for cables and connections that require energy as well. Then choose a transformer that most closely covers your total wattage. A simple equation to use is: Total wattage of all lights X 1.1 = Transformer Size. Example: 12 post cap lights rated at 4 watts each equals 48 watts. An ideal transformer size for this example lighting setup would be at least 53 watts. It's important to note that the majority of manufacturers will not maintain their warranty if not remaining within their complete system. For example, if you are installing Dekor lighting you would need a Dekor transformer to keep your warranty intact. The two items needed to power any solar deck light fixtures are rechargeable batteries and direct sunshine. The two most popular types of solar light batteries are Nickel Cadmium (NiCad) and Lithium Iron Phosphate (LiFePO4). Solar cells within the light fixtures collect sunlight and charge the batteries throughout the day. The energy is stored within those batteries until the photocell or photo-resistor detects little or no light and then turns on the LED. These solar batteries carry a certain amount of voltage which is the total capacity of the battery; therefore, the higher the voltage, the more electricity that the battery can store. The milliampere-hour (mAh) is the amount of current that a battery is capable of supplying. The battery has to provide at least as much current as the device requires. Different brands may use different batteries so you will want to make sure you are ordering the same type and size that originally came with the fixture if you need to replace them. Nickel Cadmium (NiCad) batteries are offered in both 600 and 1000 mAh with a 1.2 voltage level. These are the most commonly used solar rechargeable battery and are compatible with brands such as Aurora, Deckorators, and Classy Caps solar lighting options. Lithium Iron Phosphate (LiFePO4) batteries are a more advanced technology allowing for a more stable delivery of electricity than standard NiCad batteries. LiFePO4 rechargeable batteries are provided in both 600 and 1,400 mAh and are suitable for brands such as LMT Mercer and Ultra Bright. Though typically charged in 1-3 days of direct sunlight; to fully charge your brand new solar batteries, allow for up to two weeks of direct sunlight. Solar deck batteries may need to be replaced every 1 to 3 years depending on their typical run time and climate.